shirt I designed/made for sale…. 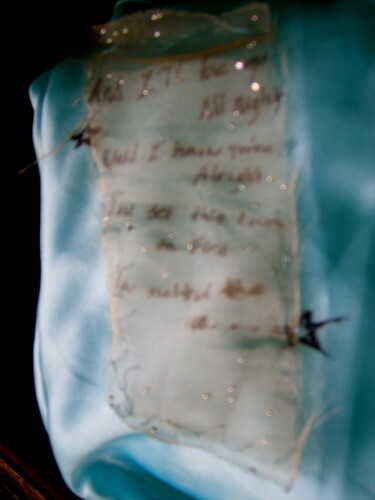 it has drawings on it that i did….on the organza, and the lyrics from the lovers’ frozen floods on it. 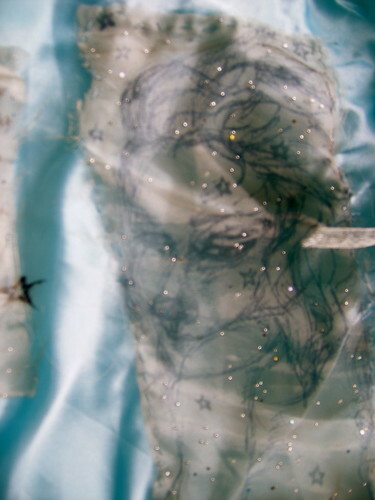 each organza panel has a different drawing-the large piece on the front is two tigers, the second square on the front is an eye, the large piece on the back is a lovely girl, and the other piece is where the lyrics are. there is a rose on the back with a ribbon train piece….it ties on the side to make it adjustable to the person wearing it. you can also pin it in your hair. all the photographs were taken by me…. Self portrait taken by me. I took these originally for a series of sequential photos im starting to take for the clothes I make/alter (in this case the tights). 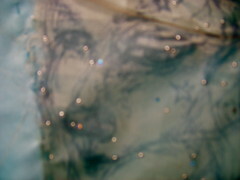 I have a lot of drawings/oil paintings/ paintings on organza panels to post….I’ll do so soon. 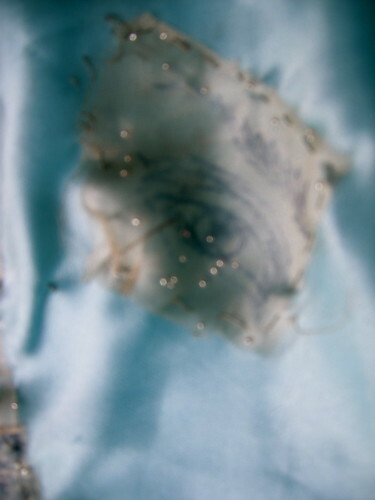 For now you have some hand pieces that I’ve made for you to wear. I’ve always been obsessed with distressed clothing…something akin to the bohemians of the late 19th century….victorian with a hint of gypsy. 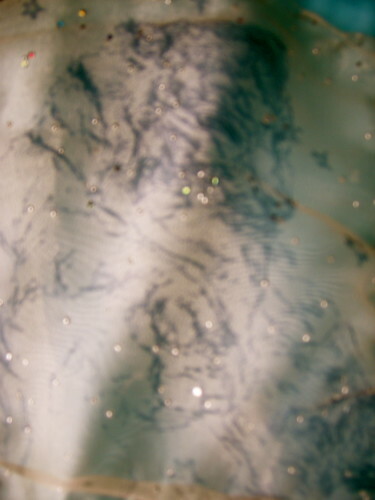 So, in turn, my clothes reflect such. 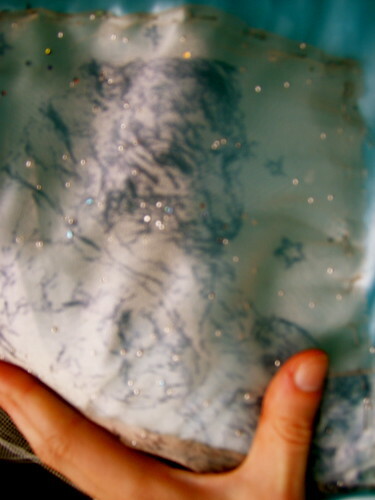 I sew everything by hand….its a personal preference even when I have a machine at my disposal. 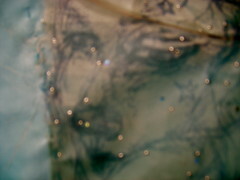 ~ by volatilestructure on June 21, 2010.
such a beautifull piece , you look like a fairy ! I like the photo at the top. For some reason the word “constellation” pops into my head when I see it. 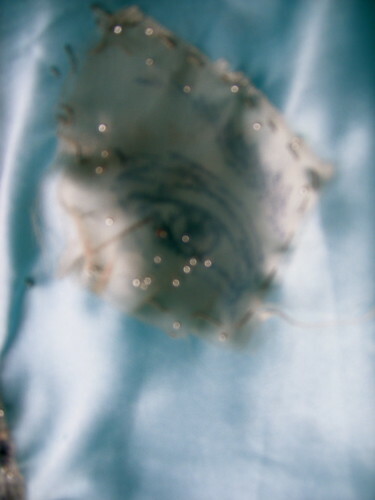 You must be very good at sewing. I like the necklace & bracelet, it has a certain American Revolution era look to it….modest beauty. P.S. You look like you like Bob Marley. 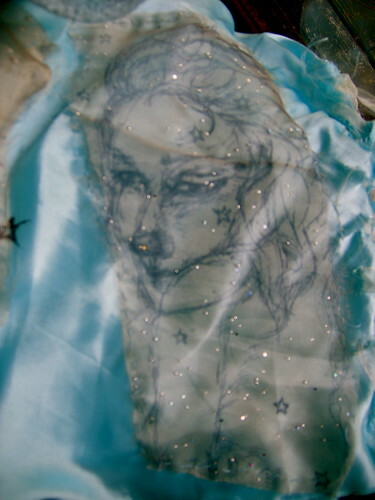 i am ok at sewing, i just get very ocd when im working on something and go over and over it again until i get it right–there’s definitely a lot for me to learn when it comes to fabric but i like creating clothing and pieces from my head/dreams…. i do like bob marley, i also like your blog a lot….very insightful. Wait, how is it ironic? 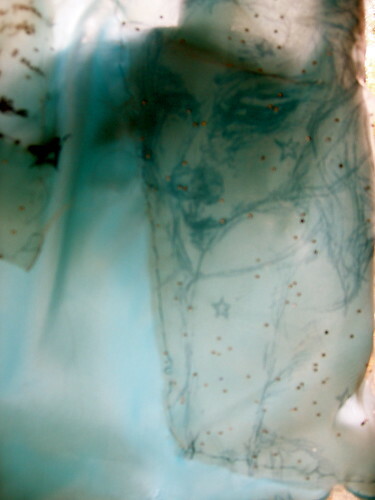 because you mention constellations….and my friend just happened to edit photographs of me with them….because even though i did not intend for the shirt to be reminiscent of stars…stars have been on my mind a lot lately. perhaps i should have just said coincidentally…. I don’t think that it was a coincidence. I think that it happened for a reason, even if I don’t know what the reason is. This entry was posted on June 21, 2010 at 8:41 am and is filed under Uncategorized.You can follow any responses to this entry through the RSS 2.0 feed.You can leave a response, or trackback from your own site.